Day one has just wrapped at the Bologna Invite with hosts of senior and U24 national teams preparing for their big championships in July. In both divisions: pool winners go straight to finals, the second place of each pool cross over for the third place game, etc. There are still some rounds left in pool play, but here is the status of each pool after day one. Italy has already wrapped up the pool by defeating Great Britain in the final round of play today 10-6. Even if they lose to Germany U24 they will have the head to head victory over Great Britain and stay at the top of the pool. Great Britain is locked in at the second place of the pool meaning they will go through to the third place game tomorrow against whomever comes second in Pool B. Pool B is a hot mess right now because of Italy U24’s loss to Austria in the final round. Anything can still happen depending on the final round. If Italy U24 beat Switzerland then they are guaranteed to go through to the finals since they will be the only team with four wins in the pool. However, if Italy U24 lose that game then there could be up to four teams with three wins in the pool and it will come down to the record between those teams1 to see who advances to the final against Italy. The Czech Republic is in a good position to get in the top two since they have wins against Switzerland and France already, but any of those teams can still mathematically make the top two positions depending on how the last round shakes out. Italy U24 shook things up by coming back from a 2-5 deficit to beat Great Britain 1 on double game point. They are undefeated, though the Swiss did give them a fight in another double game point thriller. The still have to face the German U24 and Austrian sides, but right now they are definitely the favorites to win this pool. The battle for second place is being lead by the French and Great Britain 1. If they both win their first games tomorrow morning then the game between them will determine who gets second place in the pool. Great Britain has a slightly better point differential against the top opponents, but the French have been playing pretty well this weekend and have a slightly bigger roster. Germany is still undefeated in Pool B. They almost lost to Great Britain 2 but managed to edge out a win after some confusion with the cap rule. Theoretically Italy, Ireland and Great Britain 2 could still win their pools if Germany lose to Denmark tomorrow, but if Germany win that game then they are through to the final. Denmark is out of the running for first place because if they win their last two games, they need Germany to lose to Italy to have the same number of wins as Italy and Germany. However, in that case, Italy will already have wins against both Germany and Denmark so they would progress to the finals. The race for second place is still almost anyone’s game aside from Switzerland U24 and the Czech Republic who each only have one win and will only have one more pool game tomorrow. 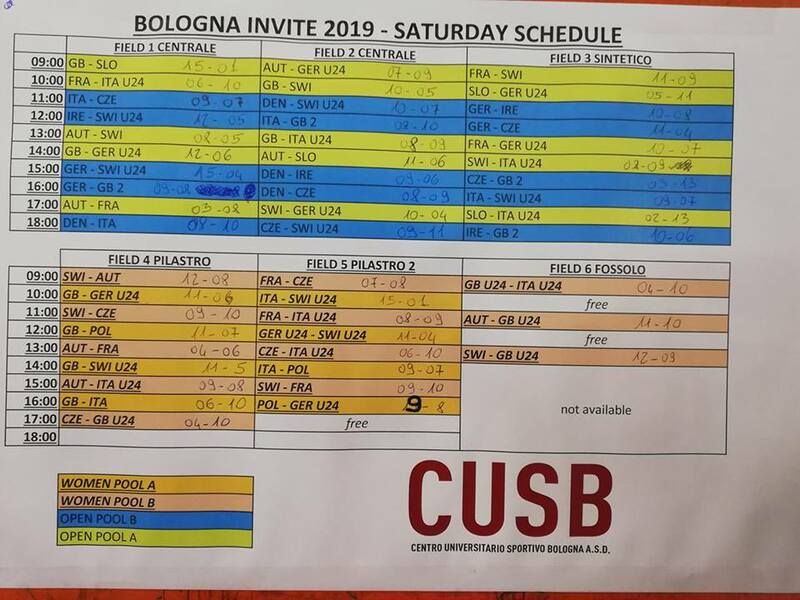 Comments on "Bologna Invite 2019: Day 1 Pools Status"